Annie Jaffrey: What I Ate Today: Raw Pizza! What I Ate Today: Raw Pizza! Hello beautiful ♥ It's now been 56 days since I started my raw vegan journey (so about 2 months)! I am the happiest and proudest I've been of myself when it comes to my body and health. I know I still have ways to go, but I feel like I'm on a pretty good path! One of the questions I get asked the most is "What do you typically eat in a day on this lifestyle?" This was also something I was (and still am) super interested in knowing about other raw vegans. I follow some great health educators to get inspiration from them, as well as following the 80/10/10 recommendations. I love this lifestyle for it's simplicity, it's purity and it's numerous health benefits. You eat super delicious foods that are just buzzing with enzymes, vitamins and nutrients. You can't help but feel amazing when you eat this way. The food I eat varies day to day. Some days I may eat more greens or more fruits, it depends on my activity level, my desires, what I have in my kitchen, what's ripe and in season etc. I always start my mornings with lots of water to wake up and hydrate my body! In the mornings, I typically have either banana milk or a smoothie (in a huge jar) or I will have a big "mono meal" of fresh fruit (usually either a whole watermelon or several oranges). Or I sometimes make myself a large jar or fresh juice from oranges, grapefruits and lemon. With all these vitamins I have no urge for caffeine! I aim to eat mainly fruit (and a few tender greens) up until about 5pm. Fruits are what give you energy throughout the day. They are easily digested so you don't feel "weighed down" digesting food. Instead you remain energized and focused. I also try to get in a good amount of water between my meals - never during. When you drink too much water right before / after / during a meal, it can dilute the digestive enzymes needed to break down the food, causing indigestion. After the pizza, I went back and had a few more tomatoes. In the evenings, I get in my leafy GREENS! I usually have a smoothie / soup and then a big green salad, but last night was an exception, but nonetheless super healthy! I leave my more "raw gourmet" meals for the evening as they can be harder to digest compared to more simple meals. Follow me on @AnnieJaffrey on Instagram for more! I want to say thank you to everyone who has been so supportive of this change I've made. I'm so happy to be sharing this life changing experience with all of you. I have noticed however, a lot of criticism (some light / some harsh), but it's something I anticipated before starting this lifestyle. I knew some people would be naturally critical of it since it's such a departure from the "mainstream" way of eating. I can understand this as I also thought it was a little "crazy" when I first heard of it, but after reading up about it, opening my eyes and really educating myself about this lifestyle, it just makes so much sense! It took me a while to build up the courage to commit myself to it, but it's so much easier than I ever expected and I feel great! I'm purely doing this for my health, my wellbeing and for ethical reasons. I am not however, doing this for "vanity" or to get "skinny" (I don't think I'd be able to last long if that was my goal lol). If you're interested in loosing (or gaining) weight in a healthy steady way however, then this lifestyle (along with regular exercise) can help balance you out to your perfect shape. Do you get bloated after eating that much fruit & veggies in one sitting? This looks so delicious! I find that the more healthy food you eat the more appetising it becomes! Everyone should do and try what is best for them do not belittle others for there lifestyle change. I like eating healthy but occasionally like eating pasta or meat but that is just me and it works for me. I like your raw pizza it has every ingredient I do not mind eating will have to give it a try. So happy this lifestyle you capture for your health is working for you having you feel more energetic and satisfy. Something I've been wanting to ask you ever since you went gluten and dairy free: When you do your research, how do you decide what's "correct"? Whenever I do research about food and diets and elimination of certain things, I ALWAYS find credible studies and articles written by doctors for BOTH sides - on one website doctors confirm that a certain diet or lifestyle is the best thing you can do and the next website says that it's scientifically/medically proven that this diet doesn't have any health benefits or that it's even dangerous to eat/live this way. I can never decide who I should believe, how do you do this? Hello Annie! I really want to give up coffee/ energy drink but being in medical school keeps me awake almost all night and it's really difficult for me to quit. could you give me some advice how can replace those with healthy, easy to make drinks? i wanna feel full of energy and be able to focus without putting chemicals in my body. thank you so much and sorry for my bad English. everything looks so doable and delicious! It would be great if you write about the feeling after you started to lead this life style. What has changed in your body compared to your diet before. Do you feel better, or constrained? I am reading 80/10/10 right now (after your recommendations :) and I want to confess, it scares me a little bit. I'd also like to know about these portions. 8 bananas seems like so much, as well as a whole watermelon in one sitting. Were the amounts depicted supposed to be for one person? or shared (like the pizza)? Hi Annie, thank you for sharing your make up and food - you are such an inspiration. 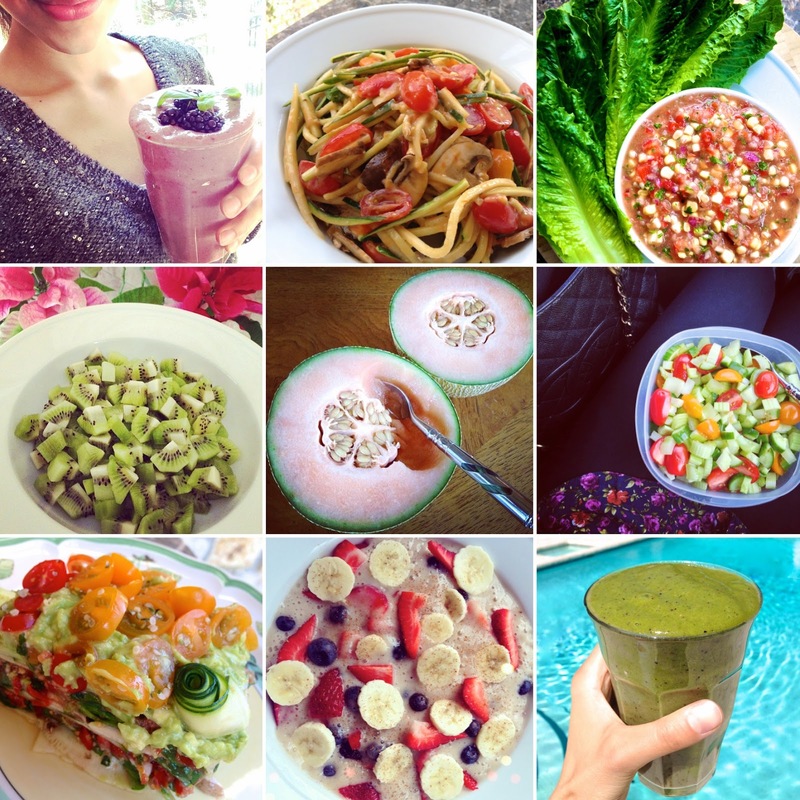 There is a (mostly raw) vegan guru in the states - Kimberly Snyder. I am not sure if you have heard of her. She has an amazing website, book and podcast I listen too. I really enjoy her work and thought you would enjoy it too. I begin every day with one of her glowing green smoothies. Would also love to see a new skincare video on natural products. I have a bit older and dier skin but would love to know what brands are you favorite. Thanks again. Annie, that raw pizza looks simply amazing! So glad that this "raw lifestyle" is working for you! You are truly inspiring! You're such an inspiration! I've been toying with the idea of going raw vegan as I'm switching between Paleo and vegan Paleo right now. I'll definitely try out some of your recipes just for a week or two to see if I feel as great as you're feeling. I'm sure I will! Love that you're sharing your journey with us. I fully support whatever makes you happy because life is about the journey to your own happiness, not about what others want to see you do. hi annie! I have a question for your Q&A video. Before your lifestyle change were you on any form of birth control? If you were, how has your new diet and lifestyle affected your birth control? Did you discontinue it and if you did why? Sorry if the question is a bit personal. I am just worried if I change my eating that something might go wrong. I have mostly found blog posts on this subject so I am having a hard time seeing them as credible sources. This is exactly the information I had no clue about...LOL! Eating raw is tough, I understand but how you eat raw is another thing that is really important. Thank you SO very much for letting us know how you eat raw in a day and when you eat it. Makes lot of sense! PS - I love your approach to negativity and criticism. It takes a lot of wisdom and strength to be the person you try to be each day. I have a lot respect for you. I would expect anyone who ate eight bananas and four mangoes (when she's not eating a whole watermelon!) a day to look like a sumo wrestler, but you appear to be just about perfect! Hi Annie, i love watching your channel.I live in Poland :-) How about vitamin B12 deficiency? Hi Annie ! I am a naturopathe. raw food is very interesting especially for vitamins, enzymes, fibers. But be careful not to forget proteins that are so important for immune system, skin, bones... Vegetal proteins are interesting (when eated from time to time) but are not sufficient. I can understand that you choose not to eat meat for ethical opinion but wild little fishes and eggs should be included in your meals. I don't want that you think I criticize your changes. I am not !! I have seen so many people developping health troubles after months of vegetalian food that I just want to warn you in a friendly way !! Sorry for my bad english and take care of you !!! This looks so bomb! I love fruit. romaine lettuce, sliced cubes or chunks of avocado, green pumpkin seeds. As for the dressing its lowfat veganaise, a little bit of olive oil, salt pepper, lemon juice and a little lime juice add as needed for whatever consistency you want for the dressing and its seriously so bomb because the avocado mixes with the dressing and its heaven seriously try it! So easy too.